The Doormouse House: The Robin Chronicles, Part III: The Family is Growing! 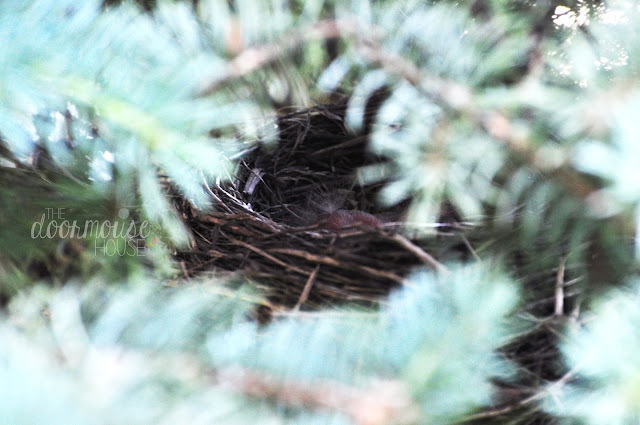 The Robin Chronicles, Part III: The Family is Growing! Our robins are back again this spring! They've tucked themselves a bit farther into the gargantuan evergreen tree that looms over our old house, so they weren't quite as easy to spot as last year. As such, we've gotten a late start on our chronicling of this year's activities. 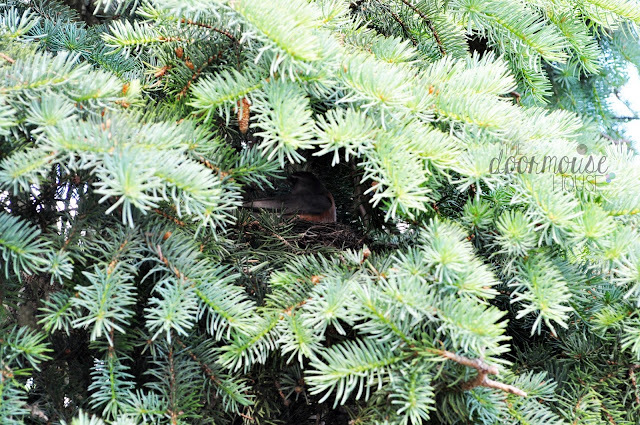 And, while we're keeping an eye as best we can as to the goings-on of this year's robin-rearing, we're making sure first and foremost to avoid upsetting Mommy Bird. Hopefully we'll get to see a less chicken-skin-esque baby bird very soon! They grow so fast, you know.